Being thankful for all my awesome boys! Submit HTE paper – still in progress! Email comments to students – still in progress! Phonotactics abstract submitted – done! Child language data – still in progress! Foster care training on Tuesday – done! My kombucha brew after 1 week, with a gorgeous new scoby on top! MavsMeet Convocation – the official beginning of the school year! In my ongoing effort toward better health and fitness, I like to do a Trim Healthy Mama Fuel Cycle every few months. These take some planning and a lot of willpower, but I decided on the spur of the moment to start one this past weekend. I know, crazy, right? Anyway, my menu is thus a Fuel Cycle menu, but it’s going to look a bit out of order since I started over the weekend. But it’ll still have 3 S (= Satisfying), 2 FP (= Fuel Pull), and 2 E (= Energizing) days, just not quite in that order. 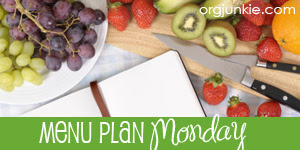 I’m linking up to Start Successful on Monday over at Felicia’s Red Door Life, and to Menu Plan Monday over at Organizing Junkie. Menu planning is one of those things that help make my week a success! I’m also linking up to Trim Healthy Tuesday over at Gwen’s Nest and Stacy Makes Cents - come on over and find all kinds of other things to put in your mealplan! Yes, it’s that time of year. The kids, in our area, went back to school this week. I’m actually really enjoying the quiet in the neighborhood. Well, maybe, it’s too quiet. I’ve been enjoying walking Pooh over to Pre-K each day – it’s less than 2 blocks and traffic in front of the school gets CRAZY, so it’s much easier to walk. But after about 8:15 it’s nice and quiet here too! planning for the move was the hardest part…hang in there! i’m totally impressed by your organization – i don’t know even know what we’re having for dinner tonight! With working full-time and the boys starting school, I’d resort to icky fastfood way too often if I didn’t plan some food out for us! Good luck on your FC! I love Kai Si Ming. YUMMY!